Based in Toms River, New Jersey, Action Termite and Pest Control has been dedicated to delivering prompt and professional pest control services for over 40 years. 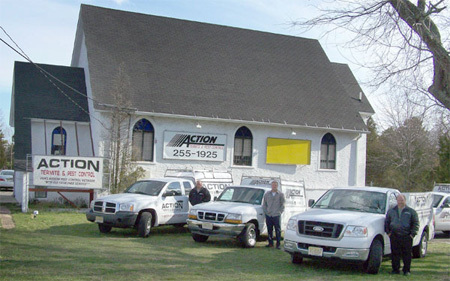 Founded in 1971, by Richard F. Russell, Action has been family owned for three generations. Action now serves New Jersey, Philadelphia and New York City. Quality control oriented, Action is your true source for dependable pest control service. Action delivers prompt and professional service to business and home owners while adhering to all EPA Laws and Safety Regulations. Action's technicians receive on-going training on Local, State, and National procedures and laws. Our highly trained staff consists of qualified service technicians and service managers that are dedicated to customer service and professional care. Action is a proud member of the NJPCA and the NPCA...Guardians of Your Environment! Email us directly at: info@actionpestcontrol.com or call 800-920-0906! Family owned for three generations and quality control oriented, Action is your true source for dependable pest extermination. Action's Professional Exterminators receive on-going training on Local, State, and National procedures and laws. Action serves NJ, New York City and Philadelphia. Action technicians follow the Integrated Pest Management methodology to provide you with the most effective pest control solution possible. Action Termite and Pest Control delivers prompt and professional service to business and home owners while adhering to all EPA Laws and Safety Regulations. Our highly trained staff consists of qualified service technicians and service managers that are dedicated to customer service and professional care. Action is a proud member of the NJPCA and the NPCA...Guardians of Your Environment! Action Termite and Pest Control offers solutions to common pests with uncommon service. Action uses the latest insecticides and insect identification procedures to quickly solve your infestation problem. When possible Action will provide removal services for pests and uses environment friendly pesticides developed to provide the most humane extermination treatments available. New Jersey has an easy choice, take ACTION.